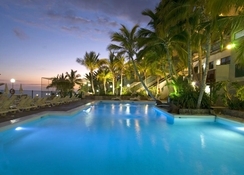 The Altamar Hotel is a 3-star residence, which boasts a lush hillside setting between the sandy beaches of Puerto Rico and Amadores, on the Spanish island of Gran Canaria. Located in the municipality of Mogan (a hotspot for tourists), Altamar is perfect for both families and couples, with a variety of sports facilities and other recreational activities available to guests. Stay entertained with swimming pools (offering stunning views of the sea), pool tables, solariums, and sports courts for those that like to stay active. The rooms of the hotel are spacious, airy and comfortable with a selection of double and suite bedrooms available - all equipped with a host of amenities. For gourmet-loving guests, the Altamar Restaurant boasts magnificent views of the Bay of Amadores and serves delicious cuisine, with a wide selection of fine local wines to compliment your meal. Want to discover the surrounding area? Gran Canaria is home to some of the best golf courses in the world, and luckily the hotel provides access to gorgeous courses such as Anti Tauro Golf, Salobre Golf & Resort, Meloneras Golf and Campo de Golf Maspalomas - a great way to soak up the year-round sunshine. 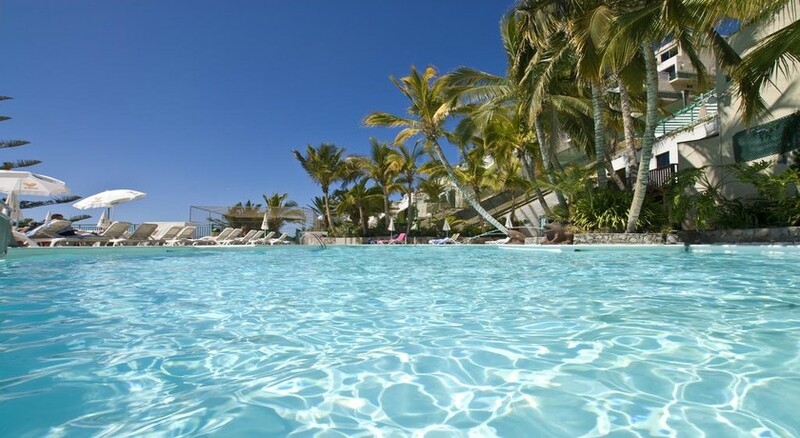 The Aparthotel Altamar is located in the southwest of Gran Canaria, in the municipality of Mogan in the tourist residential area of Puerto Rico. The beach is just walking distance from the hotel, but if you want to explore further, neighboring resorts including the capital Las Palmas de Gran Canaria, historic Aruca and Santa Lucia all have plenty to offer. The nearest airport is Gran Canaria Airport, which is situated at a distance of 49.3km. 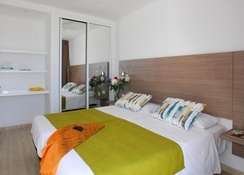 The Aparthotel Atlamar offers spacious and comfortable rooms and suites with stunning sea views. The rooms come with a variety of amenities such as a kitchen, microwave, sofa, frontal views to the sea, ceiling fan, hammocks, fridge, living room, terrace, TV, safe deposit box, coffee/tea maker, desk, solarium, phone, laundry, hair dryer and more. The units come in four categories: Double Room 1 Bedroom Sea View, Club Room Double 1 Bedroom Sea View, Seaview Suite and Club Superior Seaview Room. These rooms can accommodate up to 4 people. These recently renovated rooms also have excellent views of the bay area. The hotel’s exquisite buffet spread offers a wide variety of dishes, including menus especially designed for children and those with food intolerances. If you want to enjoy exceptional views alongside a refreshing drinks, then the bar is the right place to be, serving up delicious cocktails, wines and beers. Hit the Altamar Restaurant for a delectable evening meal matched with fantastic views of the bay of Amadores – it's delicious local cuisine and wine are sure to satisfy for cool, Canarian inspired nights. With two pool areas, a solarium with hammocks and access to world-renowned golf courses, the Atlamar Hotel also provides opportunities for excursions, go-karting, hiking, mountain biking and horse riding. For something relaxing, visit their spa for exclusive beauty and wellness treatments. Children too can have a lot of fun in the playground under the supervision of the hotel’s staff members. Read the details.Would definitely go back but avoid busy times again.Have to say definitely value for money especially if like us you go all inclusive. We have been to this hotel 5 times and will go back again. What more is there to say. Excellent. Amazing place to stay. The rooms all overlooked the sea. The food was great and the entertainment was fantastic !!! The views are incredible and did not disappoint one bit. We booked this hotel specifically for the balcony views and for the fact that the balcony was so huge it contains two sun loungers. We filled the fridge with alcohol and the freezer with ice cubes and drank each day while looking out to sea! Spar shop was super useful and very well stocked. For meats it was less impressive so I would suggest the larger supermarkets nearby. Lovely friendly staff, restaurant food was average and suitable enough - Perhaps a bit overpriced but not massively. Pools were nice and plenty of sun loungers on offer. I’d say the stand out facility is the spar shop inside the grounds. For the size it’s got so much stock - I was pleasantly surprised. Definitely heading back to this hotel in future. Just be willing to be book more than a year in advance as it gets booked up real quick and is expensive. We paid a lot of money for those exclusive sea views. Really great value for money. We were given one of the newly refurbished rooms which made the stay extra special for us as we loved to sunlounge on our balcony and the rooms were nicely decorated. You do have to walk to get anywhere but this wasn’t really a problem for us as we stayed within the hotel and didn’t want to go to the beach. There is some shops and bars nearby though which is really handy. Food was great and the pool on the B side was much quieter for us. Overall would recommend and would go back!